The machine is used for filters rubber. 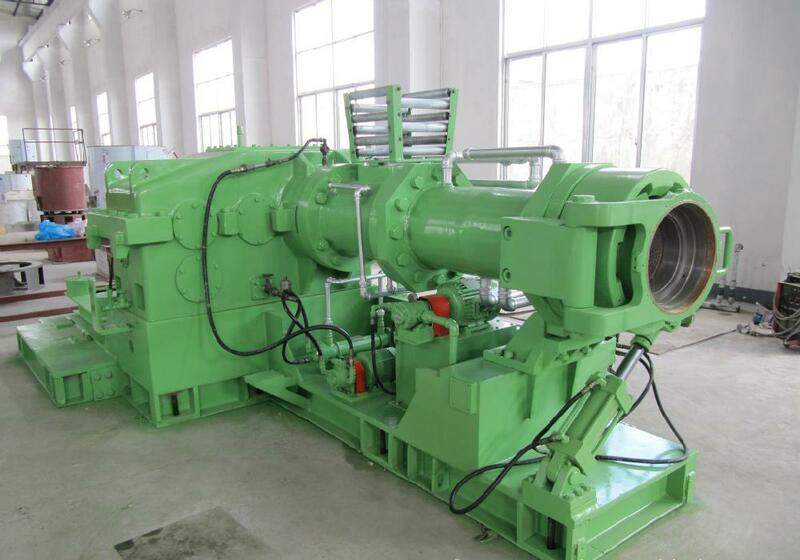 The machine is composed of head, frame, pedestal, pipeline, lubricating system and electrical control system. Screw is made of 38CrMoALA, the reducer transfers drive through the motor, and screw speed can't be adjusted. In order to heating or cooling screw, screw is hollow, add steam or cooling water through the rotated joint. Screw is a dicephalus isometry screw thread, and screw thread is wearable owing to the surface of screw thread is heating nitrous treatment. Screw works when the frame is in pressure, and the axial drive is supported by thrust roller axletree in thrust axletree bedplate. There is a hollow interlayer inside the frame, and it is convince in heating and cooling. In front of the frame, there are some bushes installed. According to abrasion degree of the bushes, we can exchange some new bushes. The clearance between screw and frame measured in diameter should be 0.330-0.447mm, it will affect the normal operation if less than 0.330-0.447mm, it will reduce capacity if more than 0.330-0.447mm. There is a quadrate feed door in the back of airframe, the rubber material input airframe, screw rotation presses it to the head, press strip through filtration web. The head is wrong tooth type, manual opens, open the nose replacement filtration web when use .uses the certain time or filtration web brushed, or else effect the throughput. In order to decrease extrude resistance, the front head makes expands out taper mouth. The head section is loaded with the thermometer, measure the temperature of the head, control the temperature of head.